One of a number of special Rolex models to appear in James Bond films over the years, the Rolex Pre-Daytona was worn by George Lazenby in 1969's On Her Majesty's Secret Service and is famous for its red needle chronograph which is thought to have been added at the request of film producers. Excitingly, the very watch which appears in the film could soon be yours as it is due to be auctioned by Artcurial in Monaco on July 18, 2016. Created in stainless steel with a 36mm case and chronograph function including 30 minutes, 12 hours and seconds counters, as well as a tachymeter scale, the calibre 722 movement is in good condition and will come complete with the original invoice for the timepiece bearing the words "This is the watch for James Bond". A collector's must-have. One of a number of special Rolex models to appear in James Bond films over the years, the Rolex Pre-Daytona was worn by George Lazenby in 1969's On Her Majesty's Secret Service and is famous for its red needle chronograph which is thought to have been added at the request of film producers. Excitingly, the very watch which appears in the film could soon be yours as it is due to be auctioned by Artcurial in Monaco on July 18, 2016. Created in stainless steel with a 36mm case and chronograph function including 30 minutes, 12 hours and seconds counters, as well as a tachymeter scale, the calibre 722 movement is in good condition and will come complete with the original invoice for the timepiece bearing the words "This is the watch for James Bond". A collector's must-have. Having been worn in every Bond film since 1995’s GoldenEye, the Omega Seamaster is about as synonymous with the modern James Bond as it is possible to be. Daniel Craig himself visited Omega in Switzerland to see the design he would wear in Spectre and, as it is the first Bond watch ever to be made available to the public, the new version is guaranteed to become an instant classic. Rolex timepieces have almost as strong a connection with Bond as the Seamaster and, indeed, it is a Rolex Oyster Perpetual which Ian Fleming picked for the spy in the original novels. However, the model chosen for the films was purely accidental. When the brand refused to lend a watch to the production company and they could not afford to buy one, producer Cubby Broccoli offered up the Submariner he happened to be wearing. It became the signature watch for all Sean Connery Bond films, including Dr No, From Russia With Love, Goldfinger and Thunderball. First released by Breitling in 1962, the rare Top Time timepiece is another of Bond’s with an intriguing backstory. Picked up by the film’s prop team for £25 at a car boot sale, it was then altered to feature a Geiger counter and became a key plot device enabling Bond to locate nuclear weapons in 1965 film Thunderball. 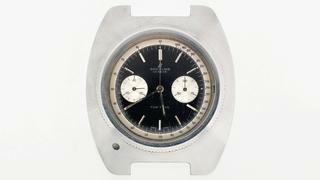 When filming ended the watch disappeared for decades before resurfacing and being auctioned at Christie’s in 2013 where it made headlines by selling for £103,875. The Seiko brand made its first appearance on the wrist of Roger Moore in the 1977 movie The Spy Who Loved Me and three different Seiko models were worn by 007 during the 1970s and 80s. 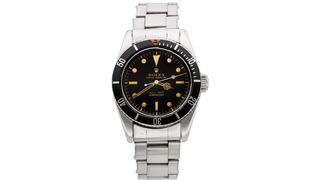 The H357 5040 starred in 1981’s For Your Eyes Only (pictured above) and has since become particularly hard to get hold of. Another of Bond’s forays into digital horology, the timepiece foreshadowed the modern world of smartwatches by allowing Bond to receive messages on its digital display.